Inflation is expected to remain low in the near term, in part because of the further declines in energy prices, but to rise to 2 percent over the medium term as the transitory effects of declines in energy and import prices dissipate and the labor market strengthens further. That “sing-a-long” has been going on for such a long time that “medium-term” has turned into “long-term” many moons ago! The Federal Open Market Committee has a problem. The problem is not that it raised rates by a scant quarter percentage point in December. The problem is the overall policy framework that led the Committee to take that action. The Committee needs to switch to a framework that is less focused on a particular time path of interest rates, and more focused on the achievement of its goals. The FOMC’s current policy framework goes back to at least mid-2013. It can be defined by two key words gradual and normalization. Both words refer to the level of monetary accommodation. In terms of the target range for the fed funds rate, the word “gradual” is generally interpreted by those who watch the Fed closely to mean about four increases of a quarter percentage point. The word “normalization” is generally interpreted to mean “returning to about 3.5 percent”. 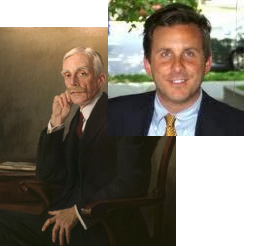 The FOMC is an Executive Committee that thinks it´s over and above criticism. It can never do wrong! But they also say that “we´re not responsible”. In fact, they sell themselves as having “The Courage to Act”! By pre-crash standards, the big central banks have made and continue to make amazing efforts to support demand and keep their economies running. Quantitative easing would once have been seen as reckless. The official term of art — unconventional monetary policy — tacitly acknowledged that. What if ordinary monetary policy isn’t enough? What if central banks can’t discharge their inflation-target mandate without a hybrid fiscal-and-monetary instrument? QE has already posed that question — it’s a hybrid too — but in a much more subtle way. When the discussion turns to the Fed sending out checks, the issue is impossible to ignore. He shouldn´t be enquiring about monetary policy for the next recession. All should be focused on monetary policy for the present depression”. It´s amazing how many have been sold on the idea that the Fed is “out of ammo” or, equivalently, “dangerously under-equipped”. The fact is that the Fed is not working it´s “firehoses” as it could. The only plausible answer to the “puzzle” is “because it chose not to”! 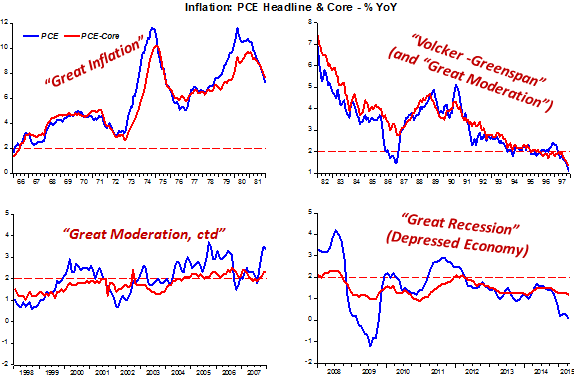 The charts below depict inflation (headline & core PCE) over different periods. 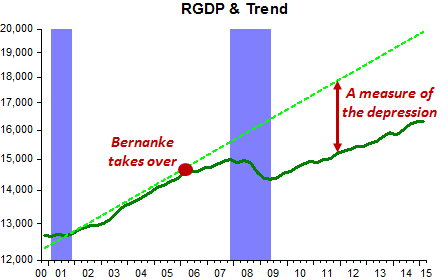 This is followed by the chart depicting nominal spending (NGDP) growth (the Fed´s “firehose”) over the same periods. 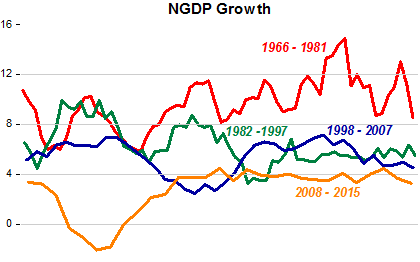 The “Great Inflation” goes hand in hand with high and rising NGDP growth, i.e., the Fed is “inflaming” the economy.. Thereafter there is the “Volcker-Greenspan Adjustment” leading to the “Great Moderation”, which extends to 2007, a period during which, for much of the time, the Fed provides the “right” amount of “liquidity”. Bernanke´s Fed thought that amount was “too much”. First, it “closed the taps” and then opened them up but with much less “water pressure”, insufficient for the “spending grass” to grow to heights it had reached during the “GM”! This very simple story is sufficient to guide monetary policy. First to enable the economy out of the depression and then keeping it from falling into another! There´s no risk of recession, we´re just depressed! I usually find Ambrose Evan-Pritchard an interesting read. However, today he spins an unlikely optimistic tale on the near future of the US economy in “Ignore the ‘whiff of panic’ as US economy stalls”. The ratio of job openings to applicants is now higher than it was at the top of the last boom in 2007 by a substantial margin. Hours worked have surged. The labour market is tightening hard. Unless Americans have gone through a Puritan conversion, their swelling disposable income must soon start flowing into the shopping malls. This is not the picture of a country on the cusp of recession. 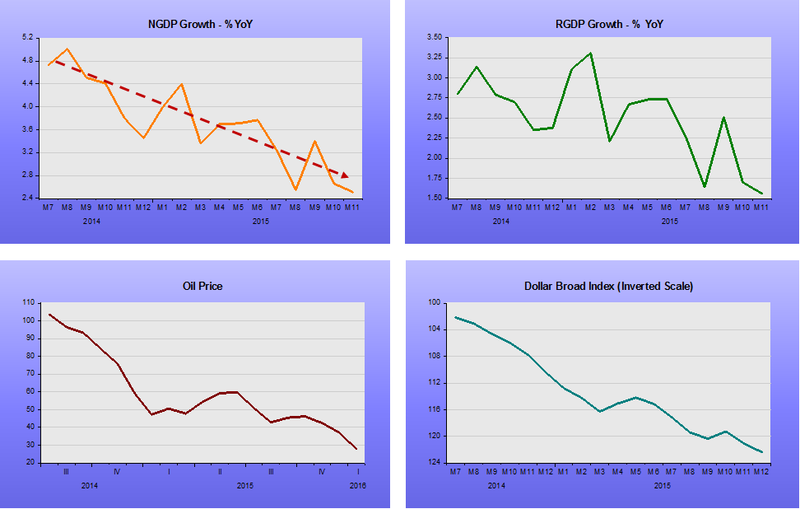 Only no one is talking about “recession”. In fact, Jim Hamilton´s GDP-based Recession Indicator Index has rarely been as low as it is now for it´s more than 45-year history! What people have stopped doing is referring to the post 2009 “recovery” as a “depression” (intimately called Bernanke-induced “little depression”). 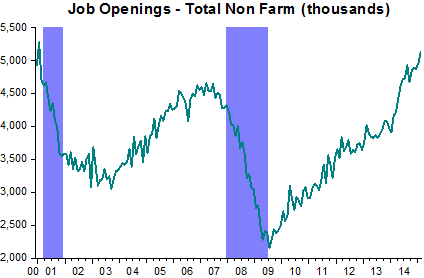 And the job opening picture is not at all inconsistent with that, which is well described in the chart below. Thinking about all this, what’s plainly missed by Ip is the unseen. Indeed, imagine how much lower unemployment would be and how much higher asset prices would be today if the Fed had allowed the economy to cleanse itself of all that was restraining it back in 2008.